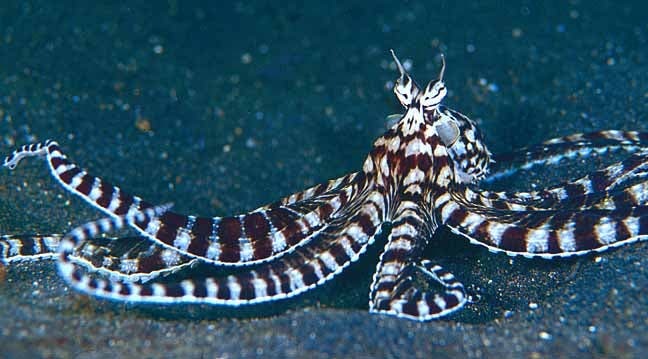 The mimic octopus, Thaumoctopus mimicus is a species of octopus that grows up to 60 cm (2 feet) in length and is naturally colored with brown and white stripes and spots. So what’s so special about it? The mimic octopus can literally mimic the physical appearance and movement of fifteen different species, that we know of (including, but not limited to sea snakes, lionfish, flatfish, brittle stars, giant crabs, sea shells, stingrays, flounders, jellyfish, sea anemones). 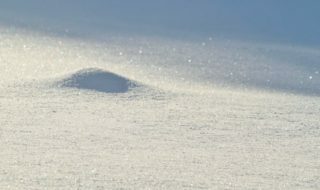 This fascinating creatures wasn’t discovered until 11 years ago; after the first one was spotted, a relatively thorough research project was launched, and in the following two years, only 9 different such creatures were seen. The mimic octopus is extremely intelligent and despite the fact that mimicry is quite a common trait among the animal world, Thaumoctopus mimicus is the only observed animal that can mimic multiple species. In fact, it’s so smart that it actually knows what animal is best to mimic. If it’s being hunter, it knows exactly what animal the predator will fear and impersonates that one.